The new Mary Ingles film directed by Spencer filmmaker Jude Miller. The film stars Miller's daughter, Screen Actors Guild actress Elliot Lowe Miller, in her first film role. The period costumes, especially for the Shawnee warriors, are as good as anything in a Hollywood film. The film was an official "indie SAG" film which is limited to a budget of $75,000. If you love WV history, see this film. Jude Miller will be present to introduce it. Judith Ann Miller was born and raised in Spencer,WV. She is the daughter of Bill and Barbara Kincaid, wife of Garlan E.Miller, and mother of a daughter, Elliot, and a son, Andrew. She is an alumna of West Virginia University and has taught school in Roane County for more than twenty years. 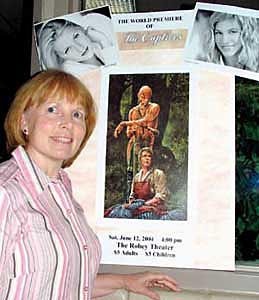 Judy, or Jude, began researching the story of Mary Draper Ingles in 2002 as a response to feelings brought on by the 9/11 tragedies.The study of people who exhibited faith, courage, and perseverance in times of great adversity was reassuring. She wrote the screenplay that summer. JTB, Jude's True Blue Limited Partnership,was established and Digital Vision Works, LLC. of Dunbar was brought in for technical expertise in cinematography,sound and editing. Filming of "The Captives" began in March 2003 and final scenes were completed in May 2004. Jude is very grateful for the opportunity to work on this project and thankful for the community of adventurous cohorts who made it possible.